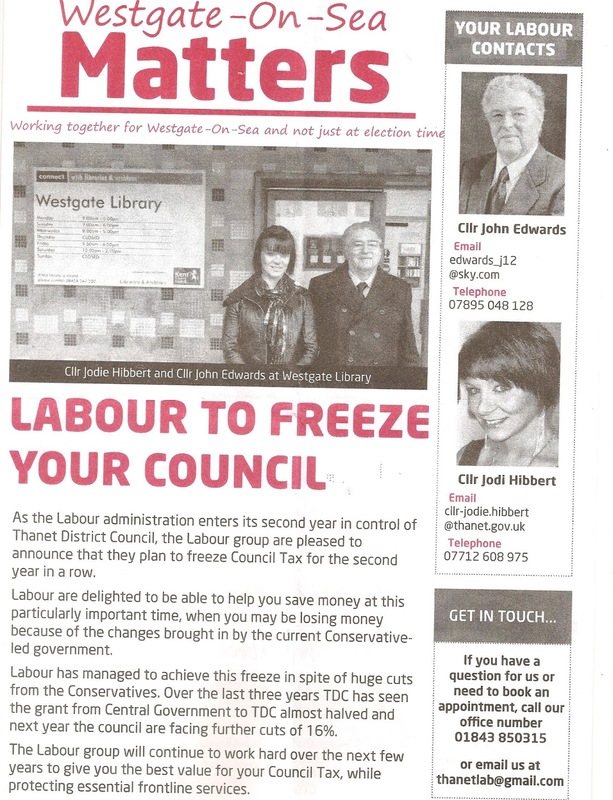 Stung to the political quick by allegations of invisibility surrounding Westgate councillor, Jodi Hibbert, Labour have sprung into action and are spending a cold and windy weekend, distributing a newsletter proving the existence of this rare and elusive creature. Answering her critics and spiteful reports that she lives in France and hasn't been seen at a local public meeting since being elected in May of last year, Jodi explains: "I am getting close to finishing my undergraduate degree... and that means I am not always able to attend every meeting." So now you know. I'm somewhat perplexed by the Labour newsletter claim opposite, to have introduced "a licensing scheme for landlords of HMO's." I really thought that the HMO (Houses of Multiple Occupation) initiative, was, as, I've been reminded, my own, as the former Conservative Cabinet Member for Planning. Furthermore, the Selective Licensing policy, was introduced by my very own larger than life, cabinet colleague, Cllr Chris Wells. In fact I think Jodi's newsletter is confusing two quite separate items of Council policy; easily done. I'm delighted that her personal campaign to save the Minnis Bay Day Centre - in Birchington - has proved such a great success in addition to her notable victory in achieving world peace and overcoming planning objections to support a micro-pub in Lymington road. So well done indeed. I've a shed-load of pressing casework to pass on and up today, after the surgery with Sir Roger Gale and maybe I should simply pass it on to more capable hands. Once again I've heard at first hand, of the misery that some absentee landlords can inflict on vulnerable people, living in the more deprived areas of Margate and Cliftonville. No heating, vermin, damp and the very real threat of eviction if you complain, as in one example I need to deal with urgently on Monday. My views on the landlords that apparently thrive on the conditions of human misery and suffering, simply isn't printable; we might be living a hundred years ago. 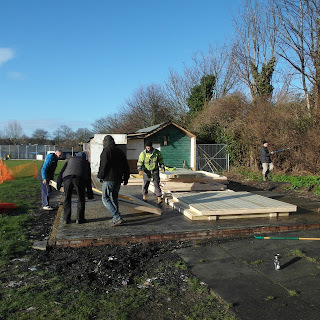 On a much lighter note, I was delighted to see the early work for a replacement to the burned-out Westgate Cricket Cub, starting today but was 'stumped' to have a note in the Council mail today, telling me this re-build requires planning consent. This is F/TH/13/0005 and I think I know the reason why and this may surround a previous 'temporary structure consent.' but I will be on the case on Monday and let the club know. 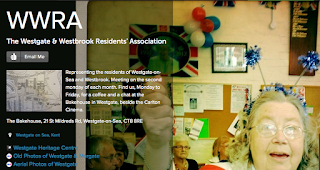 The Westgate on Sea and Westbrook Residents' Association (WWRA) have a new aggregate webpage and I've placed a link to it in my sidebar. As I go to press, I see that Ian Driver is now thinking seriously of running in the May, Kent County Council elections, on the heels of Will Scobie and of course, John Worrow's surprise announcement of last week. I'm sure Paul Carter, the KCC Leader, can't wait. Seems strange they need planning permission to replace what was there. Is this the same nationally or is this a curious quirk to TDC because to the uneducated lay person it seems jobsworth to obtain more council charges. I think it's something to do with a temporary structure requiring approval on KCC land.. but I will be finding out on Monday. 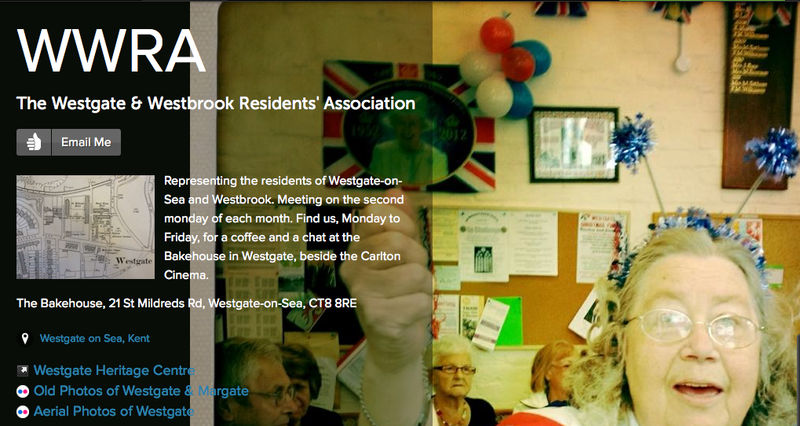 Since her handout is entitled "Westgate-0n-Sea Matters" and is therefore presumably about Westgate-on-Sea why is the elected Councillor for Dane Valley featured? And why is he not using his TDC email address? Curious. Without wishing to diminish the doubtless heart rending situations on which you have to assist, may I play devil's advocate for a moment and ask how many landlords ask for assistance in removal of unruly tenants? 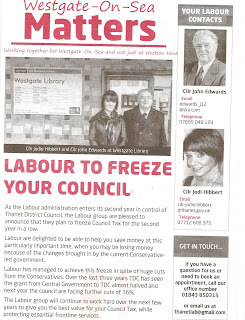 And well done to Labour, our council tax is frozen by our benevolent council, forgetting that while in power the Labour government allowed that same tax to double. I'm only too well aware of the other side of the coin, that of unruly tenants. We have to our shame though a huge proportion of rented properties that are judged unfit but crammed with the vulnerable at any and every opportunity by exploitative, absentee landlords hiding behind shell companies in London. If UKIP split the vote enough Driver and Worrow could get elected and hold the balance of power at Kent County Council. Regarding the selective licensing scheme in cliftonville, one of the main aims is to reduce the transient population in the area, sounds good, but TDC chooses a hotel in Edgar road for emergency B&B accomodation, bringing a highly transient group to the area. Hardly joined upthinking. In addition council tax relief for empty rented properties will be removed from april, whilst the previous allowance of upto 6 months relief for empty property was probably excessive and little used, to withdraw it completely will only discourage refurbishment and repairs and encourage landlords to to take the first available tenant . Is social housing also affected by the continuous council tax rule?. If cliftonville is to improve maybe a little help to landlords could help rather than just increasing costs to them . How can Councillor Driver make his Twitter remarks about our two MPs and not be hauled before a standards hearing for his inability to spell? 3:42 After Worrow's performance as a Party hopping Cllr he has no credibility and if he was to stand for KCC what Party would he now choose to represent?. His game is upno one will wish to elect him on the manifesto of "Vote for me Because I am fantastic!!" and you need me. Well Mr Worrow we do not. "Threat of eviction" ? Is this in some sort of unsecured occupancy ? Otherwise the law assumes a tenancy agreement by default. And for a Section 21 notice it has to be served with a correct period of notice expiring on a rent due date. That only gets a possession order. To enforce it requires another application to Court and then bailiffs have to notify the eviction date. Police might attend to prevent a breach of peace. But the day before the eviction is when the council adopts a duty to house the tenants due for eviction. Average cost to landlord is about £5300 to get rid of problem tenants legally. When Universal Credit comes in this cost will leap to about £18000 to include the longer period of accruing rent arrears. I think I sent you the BARLO details ... the scheme run for private landlords by Bolton Council. Thought that would interest you. Seems quite good to me. When Universal Credit comes in I will probably join a large number of landlords in promptly sending keys back to the Building Society and, if necessary, declaring bankruptcy to land the Building Society with the negative equity, repair liability (for damage done by tenants) and accruing rent arrears. IE To make the lenders bear the loss. One bankruptcy broker up North is doing a roaring trade already. One landlady sent over 40 sets of keys back to Building Society in one hit. When IDS Universal Credit comes in stand by for chaos. Councils and Housing assns think that rent arrears will only rise by 50% !! Don't base yer planning and development and repair budgets on that assumption eh. Gypsy J, had a look at the BARLO scheme, nice to see a council trying to positively engage with private landlords, i became accredited as per TDC's recommendation and suggestion of discount to the selective licensing scheme. Took numerous emails and calls to have accreditation acknowledged, discount for being accredited only applies to one unit in any building, so having 8 flats in two buildings only received discount on two units. Not enough to cover direct cost of accreditation let alone time and expenses. As usual TDC only interested in taking your money, nothing comes back.